Today’s post is gonna be pretty long, so grab yoself a cup of coffee or tea and settle in for a spell while we talk about my journey to decorate my living room on a budget. This room has been a long, slow process of trying a million different things until I got it “right.” I go through a lot of back and forth, trial and error, victories and losses before I get a room the way I want it, then it pretty much stays that way for the most part until something doesn’t work for my family and then I re-adjust things. 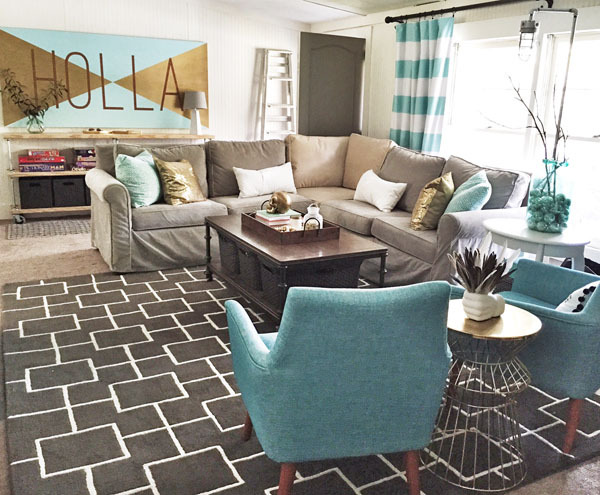 Before we jump into what it looks like now, let’s look at how my living room looked just a few months ago, during the Summer Tour of Homes…. The new sofa! My daughter (Lala) moved out into her first house and she and her roommates had NO furniture, besides the things in their bedrooms. My old couch was still in great shape, but after buying some new chairs and playing with the arrangement, I was fairly sure that a sectional was the way to go. So I went on a quest for a new one so she could have my old one. With that in mind, we looked all around and found the two ends of the sofa in a different spot than the center. Originally we were going to buy the ends then order the center, and then we found one. But, it’s a different color. I looked online and to buy a new Cameron Sectional from Pottery Barn would be over $2100, plus an additional $800ish to buy a slipcover. I found all three pieces for a total of $900. I ordered the matching corner slipcover (with a coupon code) for under $200, so all total I’ve spent about $1100 for a $3000 sofa – not bad, huh? And I got to take it home that day (usual wait is 10-12 weeks). Whew! That was a lot, huh? I moved the blue chairs (those beauties are from Urban Outfitters) to the other side of the room, and I was surprised that the whole area finally (FINALLY!!!) seemed “put together.” It’s a long, skinny room with lots of doors and walk throughs – so it literally took me 10 years of trying to get it right. Now the room seems warm and inviting instead of too big and cold. And I can never seem to stop myself from adding in cute junk that I love. Because if you’ve gotta have stuff, why not make it stuff you love? And I love my superhero pillows. Amen. Let’s talk a sec about the cheap stuff. See those pillows? The blue one with the triangles is from H&M and was $4. The gold one up front? That little rock star was $5 half price at Hobby Lobby. Wonder how my living room looks so neat? It’s because I’ve added in a TON of hidden storage. 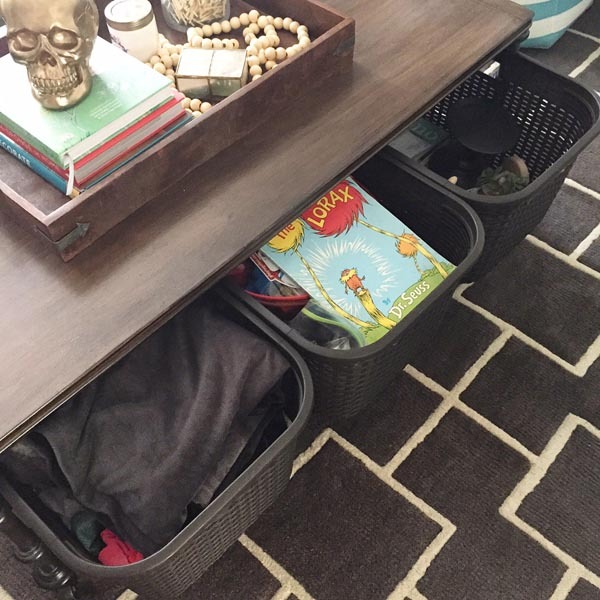 These baskets hold everything from Brady’s toys to random socks awaiting their mates from laundry jail. Shhh… let’s keep that a secret. The blue cabinet under the TV? A $13 Goodwill find that I gave a makeover. It holds all of our TV equipment. 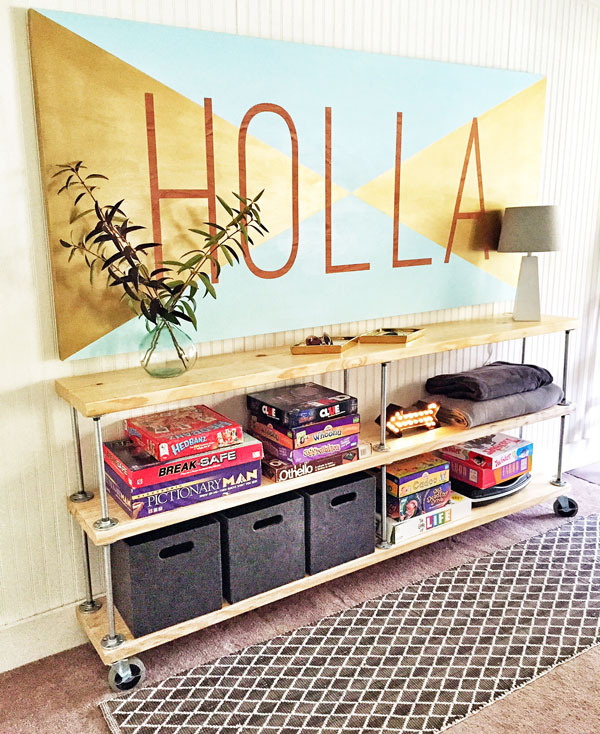 And this is my newest piece – a huge industrial style cart we built for our living room. Tutorial on this baby coming soon! The gold table between the chairs? It was $18 on clearance from Target. The rug? On sale at Homegoods. So many great bargains all packed into one room, but I feel like it doesn’t really look that way. It’s because the better quality furniture brings up the effect of the cheaper things we add to fill it all in. It’s like a really great dress with some Forever 21 jewelry, it looks great and no one knows the difference. So that’s my fresh living room on a budget. And, as a last note, I just want to add, it took 3 years to cultivate all the stuff you see. It wasn’t put together in a day or even a month, it took years because that’s what makes the magic happen. And while I realize that my style isn’t for everyone – at least I feel like I’ve found something that truly reflects our family – our personalities, our needs, and that’s what home is all about. I am absolutely in love!! I love the rustic/industrial style but always had trouble envisioning my home that way because I NEED color in there as well! 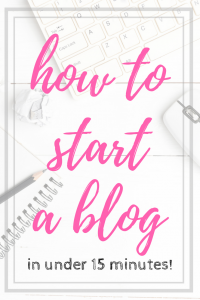 I’m a new reader to your blog and I can absolutely positively say this is what I have been needing all along! The rustic industrial details with color and quirky finds mixed it!! Love it and thanks for sharing! Oh my goodness! I love everything about this room! 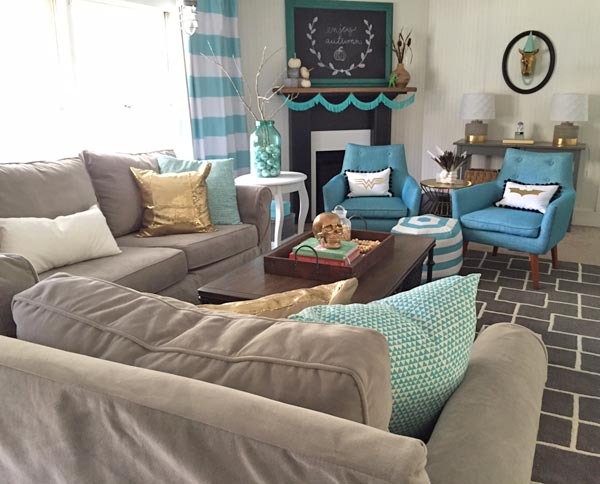 The pillows, the decor, the colors! I can’t choose what my favorite things is! Awesome! I love the new sectional! It really does pull the room together. 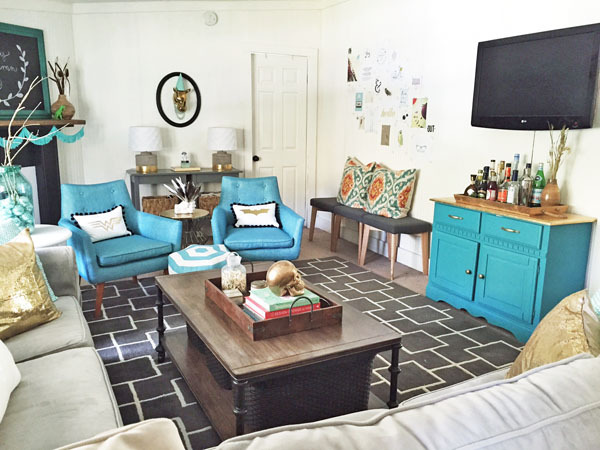 And I’ve coveted your blue chairs since the day I saw them on your blog! Your living room is very lovely. Ours is a work in progress, as well. Literally a work, since the house itself isn’t quite finished, so while we live in a dried-in home that is going to be a beautiful thing, we still have sheetrock walls and plywood floors! It’s coming together slow, but sure! The new sectional is so perfect for this room. I love the way you shop and put things together on a budget, that’s the way most of us have to do things. Your room look great. 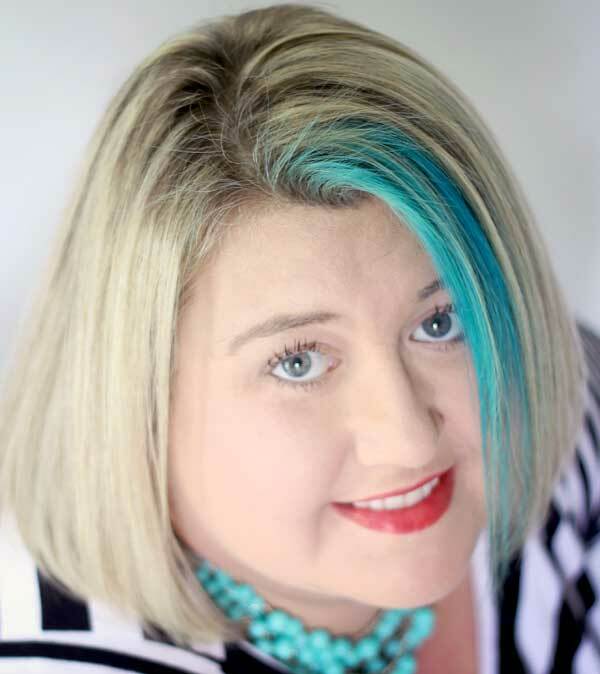 I love your place – stylish yet functional! I MUST ask where you got those curtains?? Kudos! 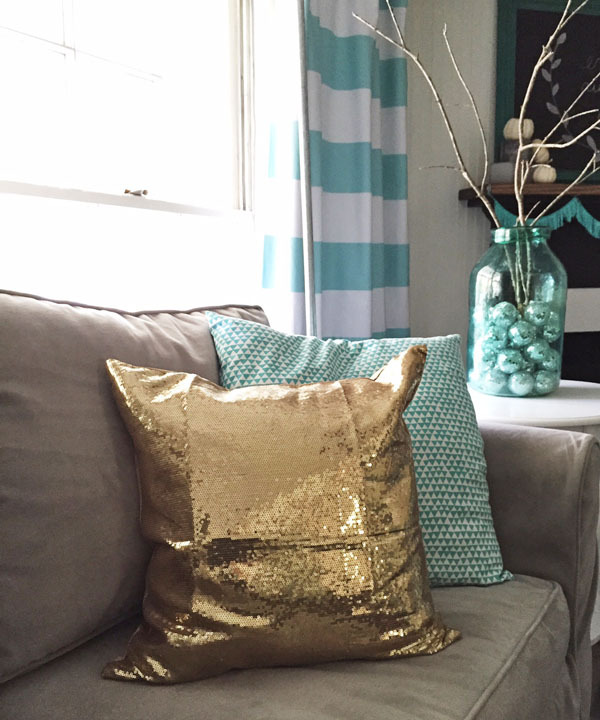 A thought for your sectional piece until the new cover arrives… perhaps a nice, inexpensive throw just to drape? Even without a cover, the whole room is lovely. 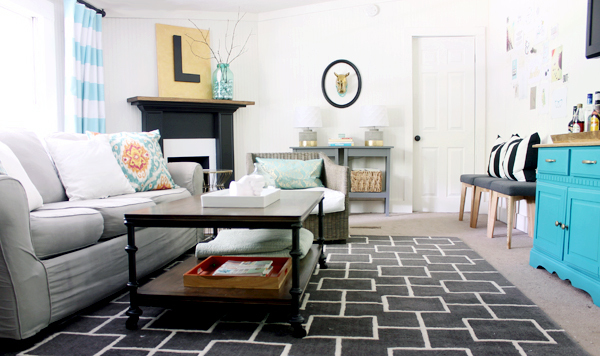 LOVE, LOVE, LOVE THE RUG!!! I want one just like it. I can’t believe $13 and you made it look incredible! Love every detail of the room, big to small! LaLaL♥ve your room! I follow u on Insta (did ur follow me Sunday last week, so FUN!!!! 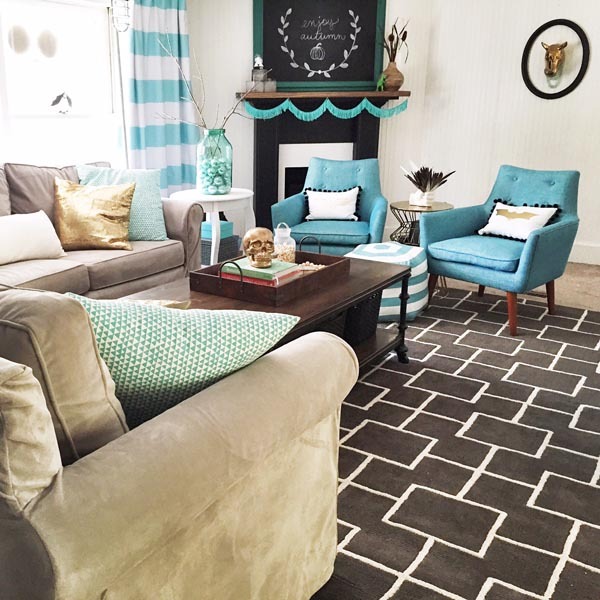 I totally agree with you, having the big ticket pieces & adding your beautiful rug & other fun touches make it all work!!! Your room/decor is SENSATIONAL!!!! 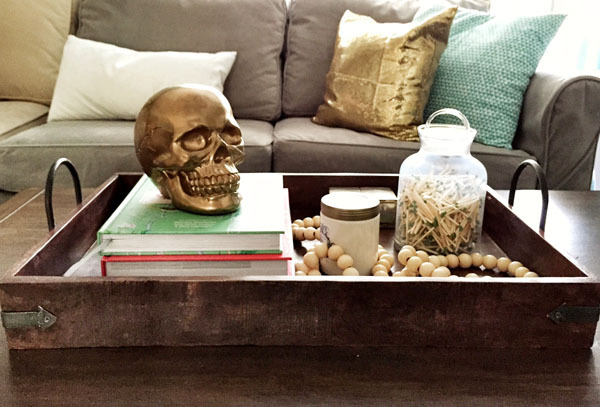 I see Nate, Emily, West Elm, Urban & most importantly “Gina” in your home!!!! I too, am always changing/mixing treasures/my thrifted goodness all the time! I used to have a lot of color, then switched to more of a cohesive boho/black/white/camel/metallic and lots of fur & sweater-ish stuff & throws to the mix~~it’s always evolving, that’s the fun of it RIGHT? We will never be done!! Hahah!!! Including my new brass light fixture yard sale FIVE DOLLA score!!!! Keep posting your uplifting REAL Instas & your blog! First thing I look at every day at work (sssh don’t tell anybody)!! 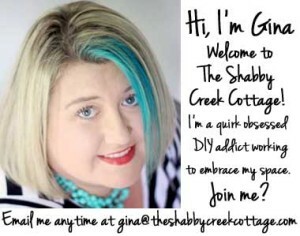 I live, eat, dream my home~~craftin/decoratin/repurposin/diy~in/ You are awesome, so REAL and just uplifting as all get up!!! Thank you again!!!! Kimber (my insta is Kimberoo/just followed me!!! How beautiful! It feels cozy! Now I want a sectional sofa, too. Hmmmmm….. Must work on things…. Love it!!!! I think my favorite part is the pair of aqua chairs. You’ve done an amazing job!! Congrats on the awesome couch score. Please let us know how you rate the sofa over time. You make me want to go to the PB outlet! Gina, you’ve done a really nice job with all of it. What I like the best tho is that you admit that it took 3 years to accumulate all the stuff, that it wasn’t overnight. That’s why your room ROCKS, there is a lot of thought and effort put into it. Really nice job and I love the aqua. The room looks great. I have been struggling for awhile with furniture placement in my room for awhile because i don’t like the back of chairs to the fireplace. 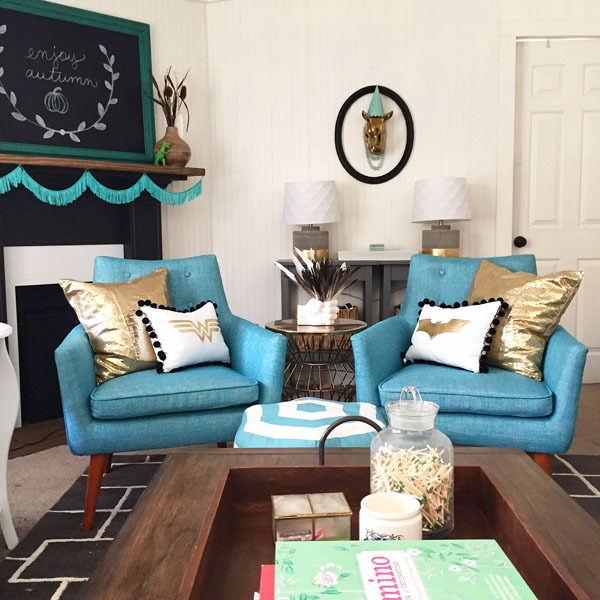 You just went with it…really not making the fireplace a focal point in the room. Maybe i will try that. I’m always up for moving stuff around! 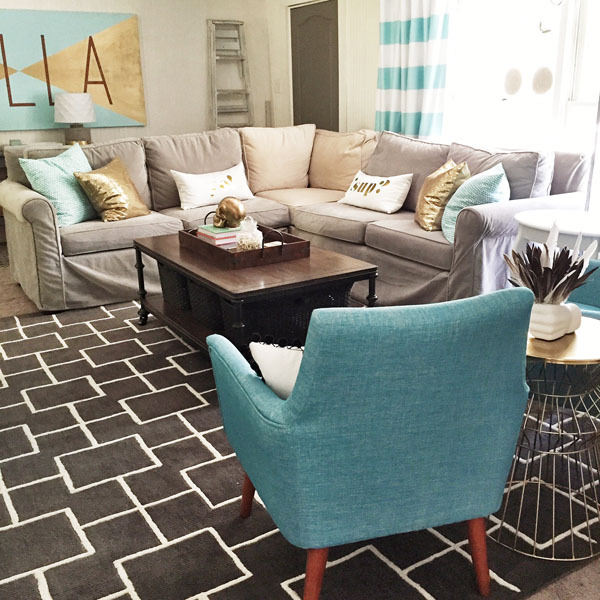 Your living room looks fabulous! Can I ask if you made the industrial standing lamp? I love it! Tutorial for lamp coming soon. I bought dye to dye my slipcover Saturday night, but now I’m chickening out. any tips? LOVE it, GIna! It’s gorgeous!